Senna (Cassia angustifolia) is a small shrub that grows about two feet high and is found predominantly in Egypt, India, and the Arabic nations. It has traditionally been used as an herbal laxative to support regularity. It works by interacting with the bacteria in the digestive track, resulting in intestinal contractions. These contractions are caused by the anthraquinone, an ingredient contained in senna. Senna is generally used by people suffering from constipation. For relief, a person should take one capsule. Usually a bowel movement should occur within six to 12 hours, but be sure to drink plenty of water. 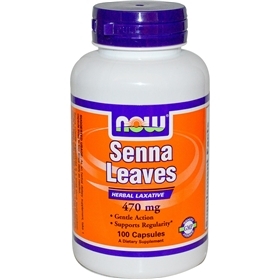 Senna is also used for IBS, hemorrhoids, and weight loss. Warnings: Do not use this product if you have abdominal pain or diarrhea. Consult your health care provider prior to use if you are pregnant or nursing. Discontinue use in the event of diarrhea or watery stools. Do not exceed recommended dose. Not for long-term.